North Denes tower mill No. 5a was built c.1822 to replace the original towermill on the same site that had been built n 1779 for T. & R. Hammond. The mill had a domed cap and was turned to wind via a fantail. Power supplied by four 30ft patent sails drove pair of 4ft 8ins and one pair of 4ft 6ins French burr stones, two flour mills and a jumper. The sails were attached to a cast iron windshaft that drove a 30ft oak upright shaft with a 10ft headwheel. 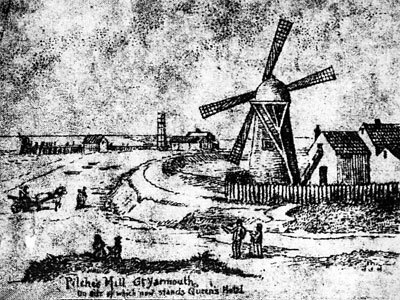 The picture above although claiming to show Pilch's mill, may in fact have been the earlier_mill on the same site as the mill appears to be powered by common sails and there is no fantail. 3rd Rate from Lady 1820 1s. 8d. per month. 4th Rate from Lady 1824. Notice is hereby given to all persons who are indebted to the Estate of the said Bankrupts to pay the amount of their respective Debts with one month from the date hereof to Mr. Thomas HAMMOND the younger of Great Yarmouth, Miller, one of the Asigneees, otherwise legal means will be taken to enforce the payment thereof. Dated this 4th day of August 1831. 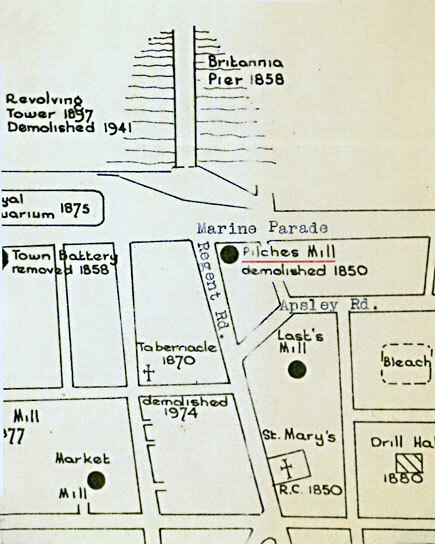 The 1831 Survey of Great Yarmouth by S. A. Rumball contains a plan of the town by R. K. Dawson that shows HAMMOND'S MILL in Market Ward. A Brick TOWER WINDMILL situate on the Yarmouth Denes, having patent Sails, two pair of good French Stones, two Flour Mills, Jumper etc. The Mill is in good repair and now in full Trade. Apply to Mr. John Green, Surveyor, Regent Street, Yarmouth. 3rd Rate from Lady Day 1835. Thomas Hammond owned the mill until 1842, when it was bought by Anthony Pilch. 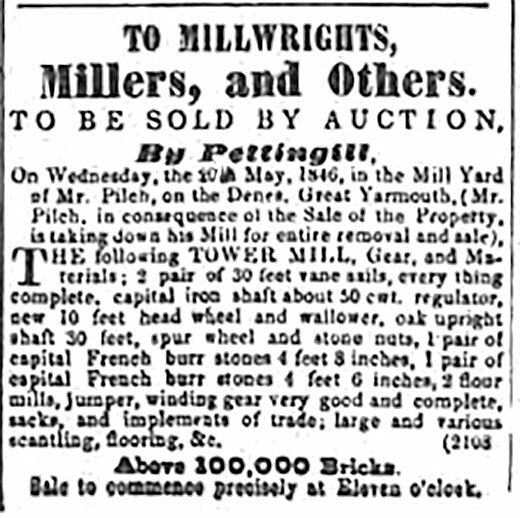 The final owner of the mill was Edward Steward of Norwich who demolished the mill c.1855 in order to build a summer residence. The site later became the site of the Queen's Hotel.